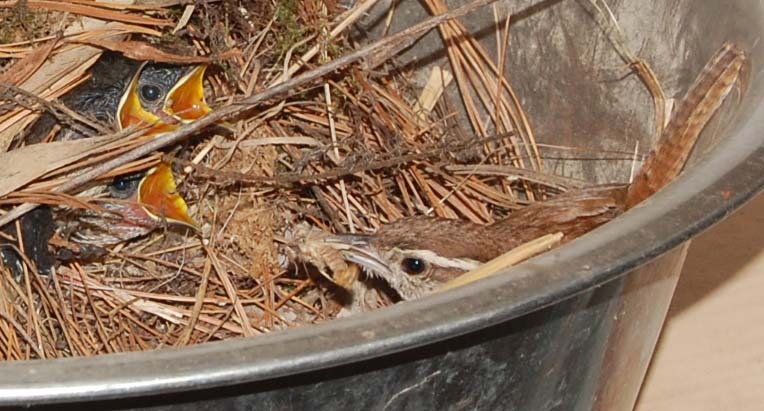 Carolina wrens nested in our yard for the first time this year (2004). The first brood was reared in the radiator cowling of an old Farmall tractor in a wagon shed. I discovered the nest as I was about to crank start the tractor causing the female wren to flush from the nest. So much for using that tractor for the next couple weeks, but, luckily, two other tractors were available. 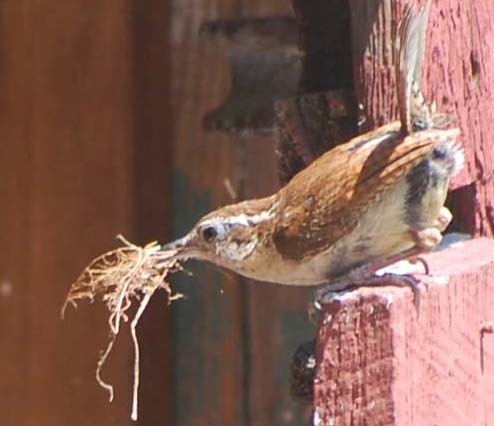 I had often wondered if the reason Carolina wrens hadn't nested in our yard was due to the large population of house wrens. 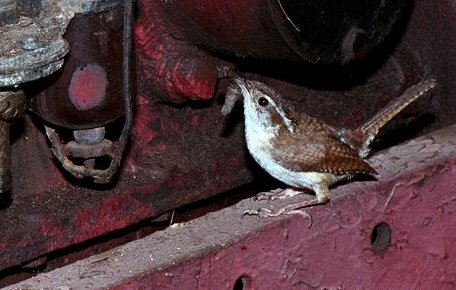 But, a pair of house wrens were nesting at the same time, just 40 feet from this tractor nest and there seemed to be no interaction between the two species. 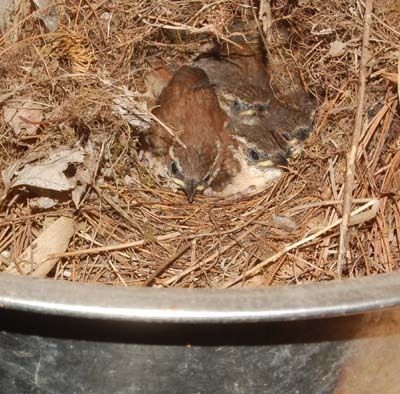 Soon after the first brood successfully fledged, a second nest was discovered in the hay loft of the barn, built in the wire cup of an old apple picker. This brood also successfully fledged. As of today, Nov 6, 2004, the Carolina wrens are still present in the yard, so it looks like we have new permanent residents. The Carolina wrens are huge in comparison to the house wren and are not quite as boisterous. They also seem to not share the bad habit of destroying the nests of other cavity nesters. 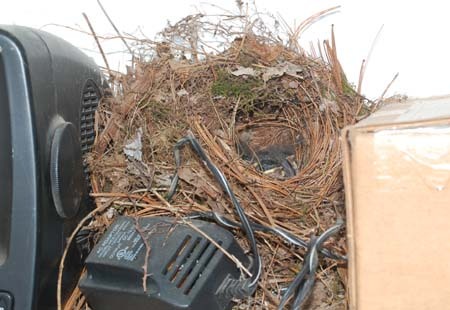 When the Carolina wren alights near another bird's nest box, I don't feel the chill running down my neck that the house wren elicits when doing this. I was surprised several times by a loud and unfamiliar bird song coming from behind the wagon shed. This species uses a variety of songs and I imagine there are others that I haven't yet heard. 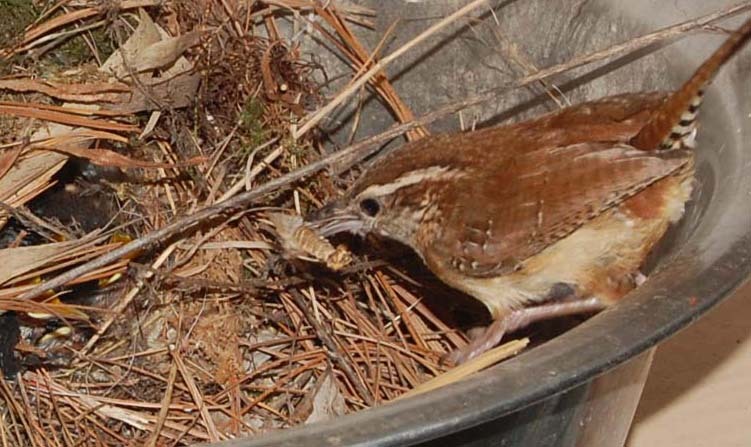 The Carolina wrens were almost always found foraging low to the ground, either hopping about on the ground, or picking off insects on the 2 ft tall vegetation where I had recently cleared the debris of a fallen outbuilding. During winters of heavy snow cover, the population of this species often plummets. Hopefully we will not have a severe winter and this oversized and mild mannered wren will be a permanent addition to our yard. 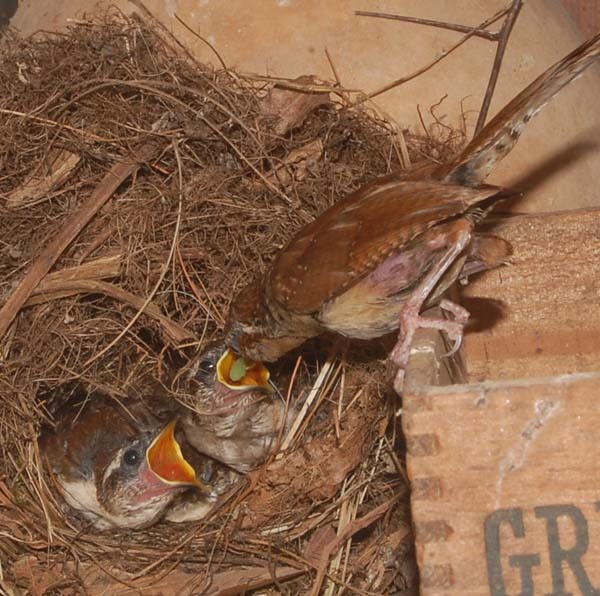 2012 update Carolina wrens are nesting in our yard each year, often moving their second nest to a different building, but this year they had two broods in the old darkroom. When I no longer needed to develop film and print halftones for the print publications, the darkroom was no longer needed. The room was gutted and an end wall removed, allowing easy access for any creature that entered the adjacent wood shop. The Carolina wrens were entering through the large shop door, even when it was closed, and then flying around the corner to enter the darkroom. Actually, they usually hopped from machine to machine to reach the nest site on a shelf at the rear of the long narrow darkroom. They were really deep inside the building, but enjoyed unusual privacy compared to all their previous nest sites. The darkroom is now used for long term storage and seldom entered by humans. I only found the nest by noticing the wrens secretively flitting about the end of the shop and eventually working their way around the corner to the darkroom. Their second nest was built on the end wall of the darkroom, only four feet from the first. 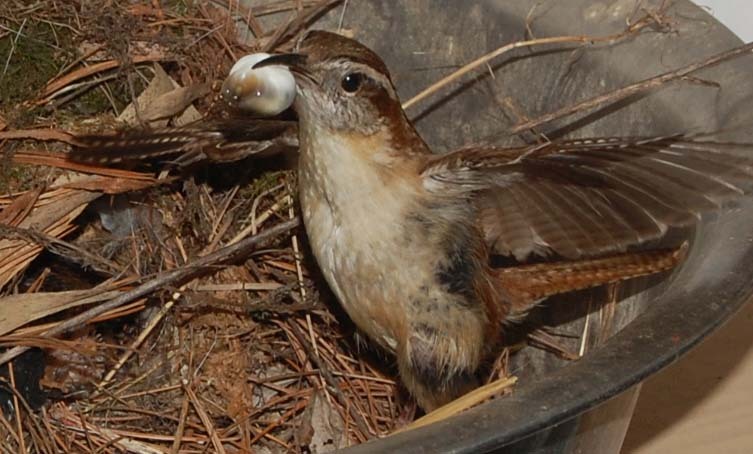 In late July of 2014, Carolina wrens were observed bringing nesting material into the 1st floor workshop. 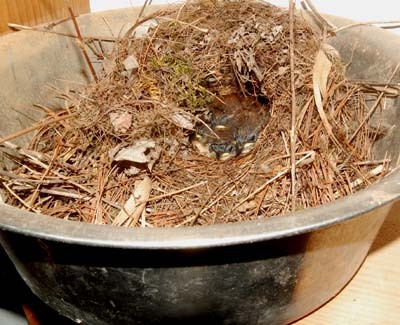 The new nest was discovered in the darkroom, in a large stainless steel pan. Both adults busily completed the new nest in two days, but then seemed to have no interest in nesting. They continued to spend most of their time in the barnyard, sometimes visiting the workshop. 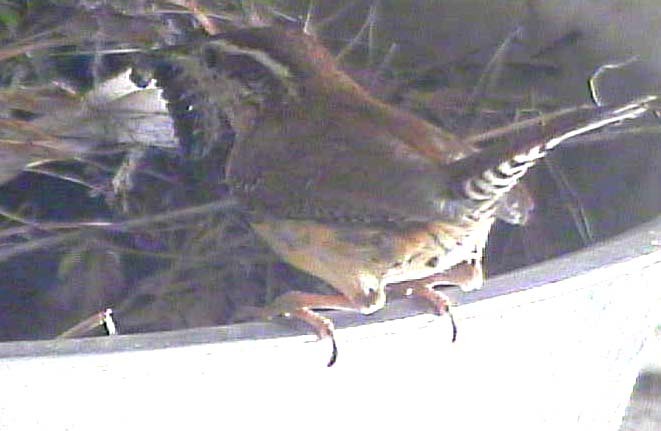 In early spring of 2015, a video cam was mounted from the darkroom ceiling and motion detection used to monitor the unused nest. In late April, nesting began. Nesting began with very few modifications to the unused nest of the previous year. These Carolina wrens, more than any other species in our yard seem to spend their entire life, year round, in the limited area of the barnyard, garden and two outbuildings. 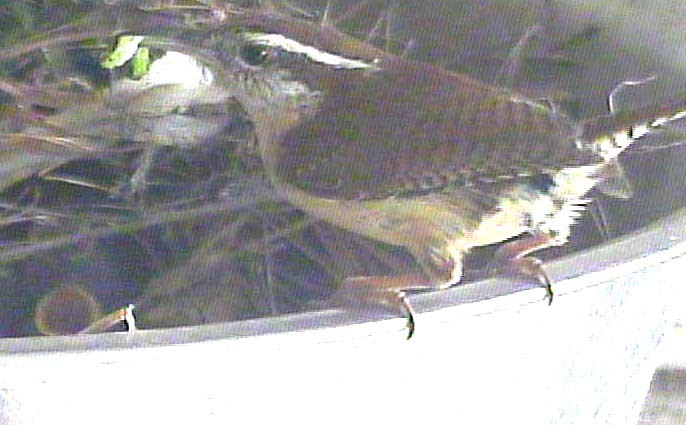 Infrared video monitoring of the nest was useful for recording the frequency of feeding visits, but seldom allowed identification of the prey brought. The images below are captured from video. 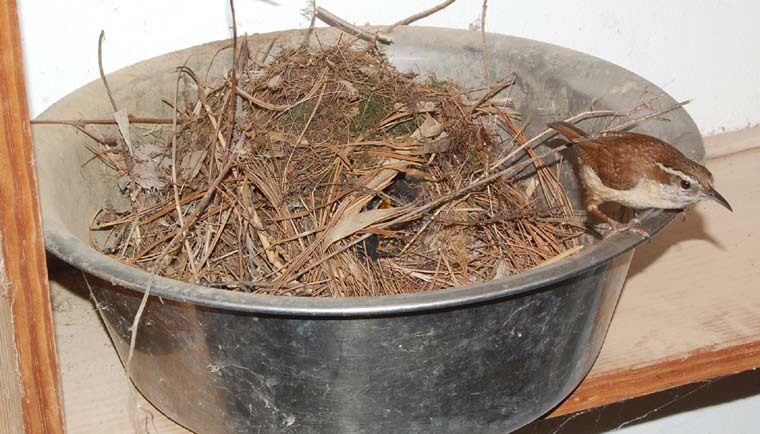 2016 Carolina wren nest - The wrens nested first in the darkroom in the same pan as in 2015 after rearranging the nesting material somewhat. Later, their second brood was discovered in the wood shop, near the ceiling on top of a cabinet. Both were successful. The first brood in the same pan in the darkroom used in 2015. 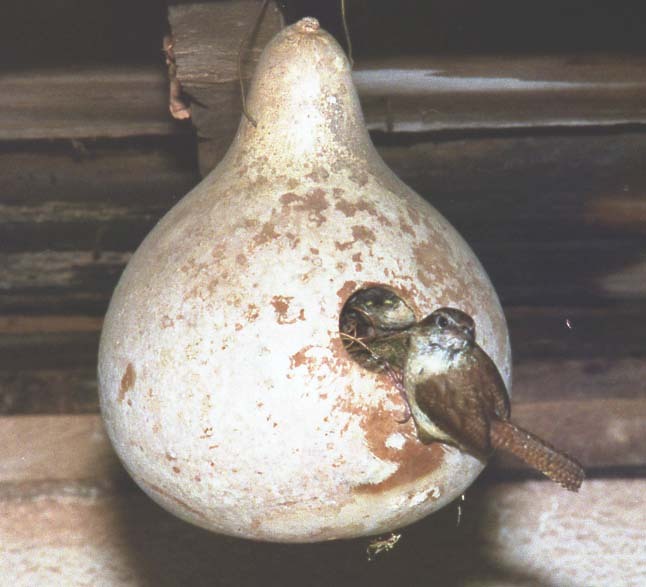 The Carolina wrens are the only species that repeatedly choose to nest in rooms where I spend a great deal of time. They are, by no means, tame, and leave or hide when I enter the room. But they seem to know that their nest is safe. Even the bright lights and loud machinery used mostly after dark does not discourage them from continuing to nest in my space. And, they have always successfully fledged young from these nests. &COPY; 2004 - 2017, American Artifacts and Richard Van Vleck, Taneytown, Maryland.